The Big Find: In The News. Sorry, this item SOLD. 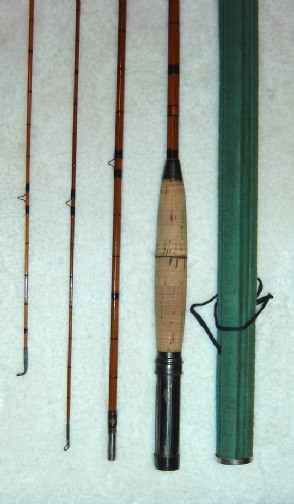 1935 Split Bamboo Fly Fishing Rod, Mint. Original case + Orvis Reel. The Big Find for collectors everywhere! This is a split Bamboo Fly Fishing Rod with six sides in impeccable condition. We believe it could be an Orvis but there are no markings to verify this. However, both the design and the memory of family members indicate that it might be an Orvis. The rod dates to 1935. It was refinished in 1945. This exquisitely handcrafted rod is a family heirloom now being sold. This fly fishing rod belonged to a retired Air Force Colonel and before then to his father, a former President of the Bank of Colorado back in the 20s. Both were Master Masons. There was a note attached to the rod estimating the value as $1,200. This split Bamboo Fly Fishing Rod has four sections and comes with two tips. The length of the fishing rod with the longer tip is 8 feet, 7 inches, with the smaller tip it is 8 feet 2 inches. There is also a canvas case. The rod is in mint condition. 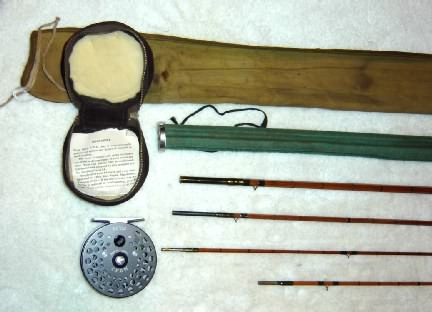 The rod is sold with an Orvis C.F. O. IV (made in England) fly fishing reel. This too is in excellent condition. It was used a very few times and dates to the 1960ss or 1970s. It has its original suede case lined in lambswool, and the original warranty. 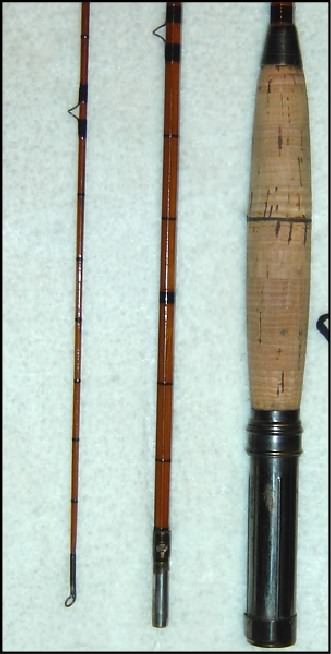 Additional photos of this split bamboo fly fishing rod and reel model are online at TheBigFind.com. Please review all images carefully and ask questions before bidding. This is an exceptional set designed for the serious sportsman and/or collector.